Item #: 9822. Classic feeder for adult chickens and other birds, with 22 feeding holes (11 on each side). Top slides off for easy filling and cleaning. Made of heavy-gauge galvanized steel for years of service, with rolled edges for safety. Item #: 9814. Classic feeder for adult chickens and other birds, with 14 feeding holes (7 on each side). Made of heavy-gauge galvanized steel for years of service, with rolled edges for safety. Heavy-gauge galvanized steel for years of service, with rolled edges for safety. 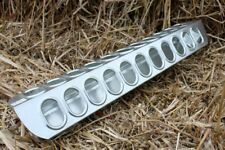 Are you looking for a feeding trough to better feed your chicken?. 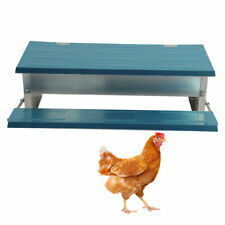 If so, you can't miss this Automatic Chicken Feeder Treadle Self Open Aluminum Feeder Feeding Trough. This automatic chicken feeder allows you to feeding your backyard chickens easily. Constructed of heavy-gauge galvanized steel for many years of service, with rolled edges for safety. Hanging feeders save floor space, reduce waste by eliminating scratching, and cut down on debris in the feed. Galvanized feeder is constructed of heavy gauge galvanized steel. Edges are rolled for safety and feature arched handles for added strength. Feeder top will need to be connected to base after receiving, very easy assembly required.Built in handle for easy hanging, portability, and easy to clean. Poultry feeder. Paint And Paint Supplies. Outdoor Living And Furniture. 15 lb capacity. Hangs for convenience. Heavy duty galvanized steel construction. CHANGING OR CANCELING YOUR ORDER Feeds 15-30 small birds. Treadle Above Ground: 2 15/16" (7.5 cm). 1x Chicken Feeder. Side plates prevent chicken from being nipped. Portable, handle for easy lifting up and carrying. Pet Supplies. 1.8lbs (800g) weight can open the lid. New and improved waste free and poop free chicken feeder. 3 ports feeder. 4 Gallon Gravity Fed. It is made of high density polyethylene (HDPE) plastic and includes a plastic handle, and it's FDA approved. Each feeder contains 1 base & 1 feeder top. 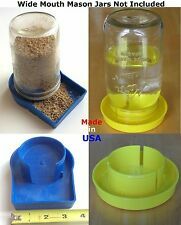 Jar feeder ( just attach any 1 quart mason jar). 2 Chick Feeders Total. (1) Small floor feeder. Material: high quality galvanized steel. Removable feeding covers. "Best chicken feeder ". 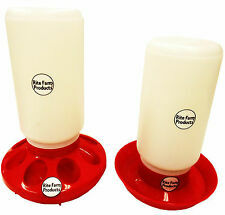 Virtually ELIMINATES cleaning of food source.no more "poop in the pan" with our Auto-Fill Chicken & Duck Feeding System. Ideal for use in pens, yards and fields. Duncan's Poultry 30 LB Space Saver Wall Feeder. Duncan's Poultry - Family Owned and Operated Since 1987. Makes the perfect oyster shell or grit feeder! Hinged lid that stays open while you refill it. The Duncan's Poultry 50 LB is made of heavy gauge galvanized steel, for a long life. It is adjustable for different types of feeds. It will work sitting on the floor, but is best hung by a chain or or cable. Classic feeder for adult chickens and other birds, with 30 feeding holes (15 on each side). Made of heavy-gauge galvanized steel for years of service, with rolled edges for safety. Heavy-gauge galvanized steel for years of service, with rolled edges for safet.